If I had a reason for living past the age of 40, I think that it's so that I could paint a miniature of Boba Fett. Surely I've been preparing my whole life for this moment. And well, now that the moment has come, it feels good. 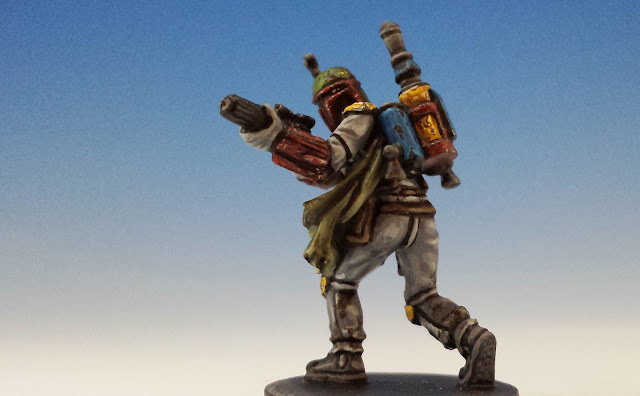 Mr. Fett is part of Twin Shadows, the new expansion of for Star Wars - Imperial Assault. 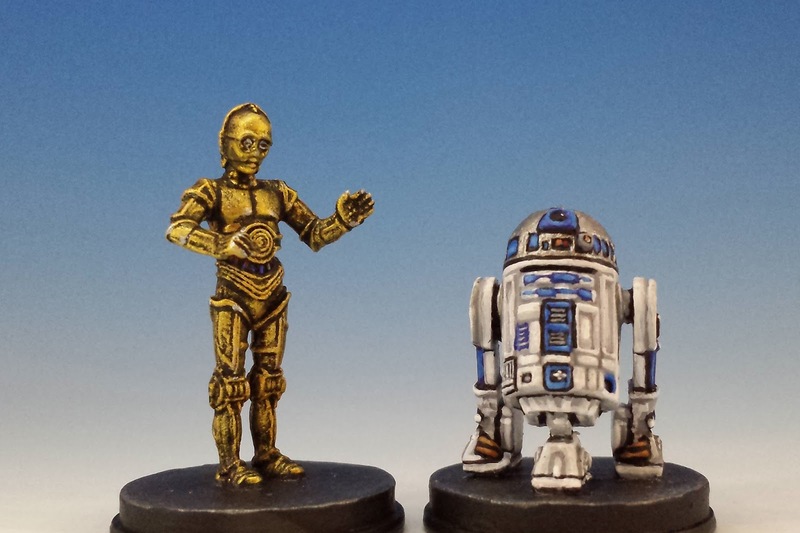 Over the past month (including a lovely week by the seaside in Nova Scotia), I've been painting up the full complement of miniatures, including Sand People, Sandtroopers, and (my personal favourite) R2-D2 & C-3PO. At the very beginning of The Analects, Confucius observes, "Isn't it a pleasure to study new things and practice what you have learned?" I wonder if Confucius painted miniatures. Seems likely because I know just how he feels. 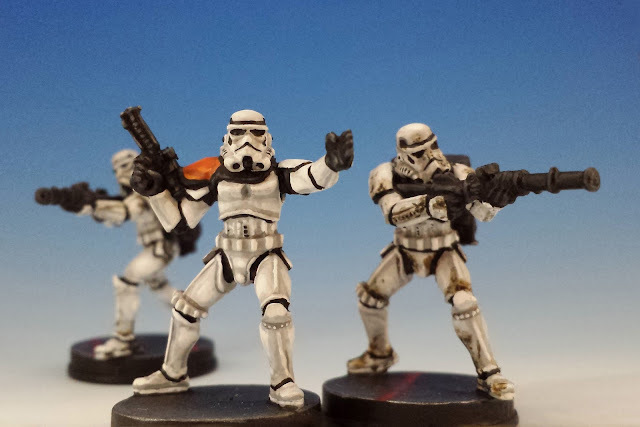 For the first time, I've been seriously studying how to apply dirt and battle damage, and trying out the various techniques on these Star Wars miniatures. Although I'm just beginning to learn this tricky business, it's been a blast. As I've written before, my initial impulse with Star Wars has been to keep the miniatures clean. 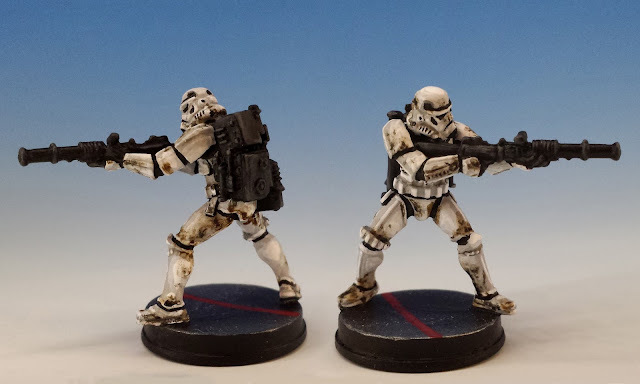 I've had enough of the sooty aesthetic of Warhammer -- instead I wanted to emulate the hygienic gleam of the Stormtroopers who first burst on to the Tantive IV. Be that as it may, I realized that painting Boba Fett without chipped paint is like painting the Last Supper and leaving out Judas. And if I'm going to present a distressed Boba Fett, I decided that I'd also make the Heavy Stormtroopers look like the poor, dirty grunts on Tatooine. Dirtiness is a tricky thing to paint using regular acrylics. I find that acrylic washes pool in ugly and unrealistic ways. Dry-brushing can emulate the spray of dried mud, but it's not particularly effective at showing the smeared dirt that gets into cracks and joints. 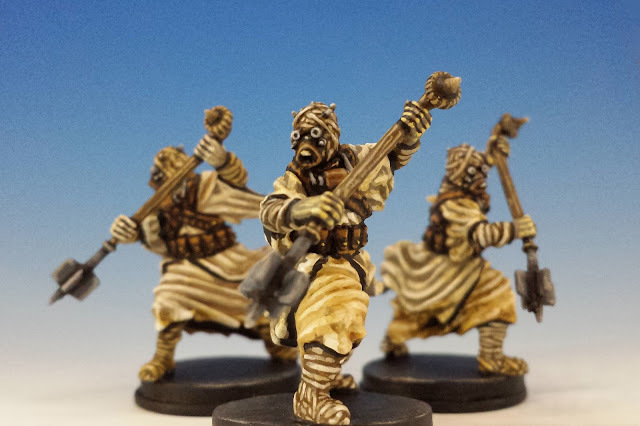 I used some powders (Sienna and Umber) to soil the robes of the Tusken Raiders, in an effort to replicate the dust of the desert -- however the results didn't stun me. So when it came to the Heavy Stormtroopers, I turned to oil paints. I've got to say, I love oils. Despite my preconceived notions, they are remarkably easy to use -- and they create a lovely muddy effect without too much effort. You just dab some paint around, and then use a white spirit to thin it, blend it and (when necessary) erase it. The best part of oils, of course, is that (unlike an acrylic wash) they have a very realistic staining effect when you thin out the edges with white spirit. And they blend like magic. I enjoyed using oils so much that I also employed them to dirty-up Boba Fett's pants. Somehow I have trouble believing that Mrs. Fett is scrupulous about doing the big man's laundry. In general, I continue to be impressed by the sculptures of Benjamin Maillet and his team. C-3PO and R2-D2 capture the intricate details of the droids. Boba Fett is full of movement and drama, as are the Tusken Warriors. 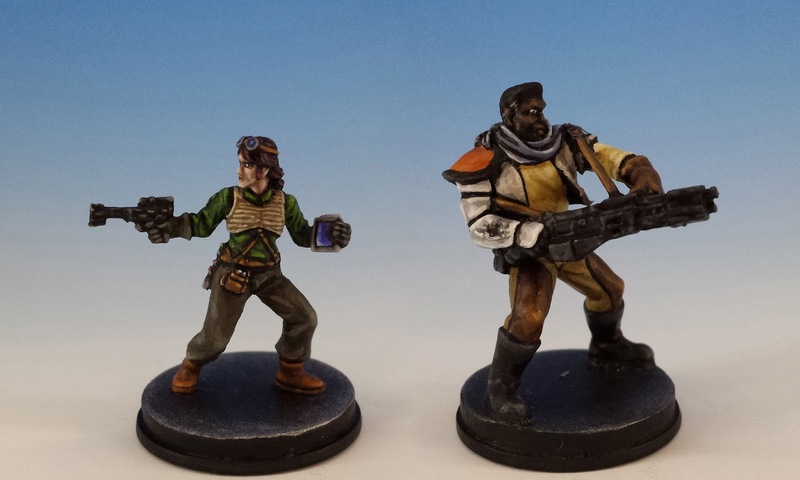 Other miniatures in the Twin Shadows box include two new Rebel heroes: Biv Bodhrik and Saska Teft. Neither are positively overwhelming sculpts -- although I do like the fact that Biv appears to be wearing some salvaged Stormtrooper armour. The final member of the Twin Shadows suite is the Stormtrooper Captain, Kayn Somos, who comes (like Boba and the droids) in an associated figure pack that you have to buy for extra. His is a simple design befitting the fascist anonymity of the Stormtroopers. I like that he wears the striking orange pauldron that denotes a squad leader. Here's one final pic of Boba Fett... what a wonderful miniature he was to paint: so much colour and so many details. Lovely stuff, your collection is most definitely a pleasure to the eye! Quoting Confucius in a blog post about Star Wars miniatures? I like it! Anyway, this is some great painting, you did the chips and grime well, I must say. It's not so much hard to paint stormtroopers well as it is easy to paint them to be boring. 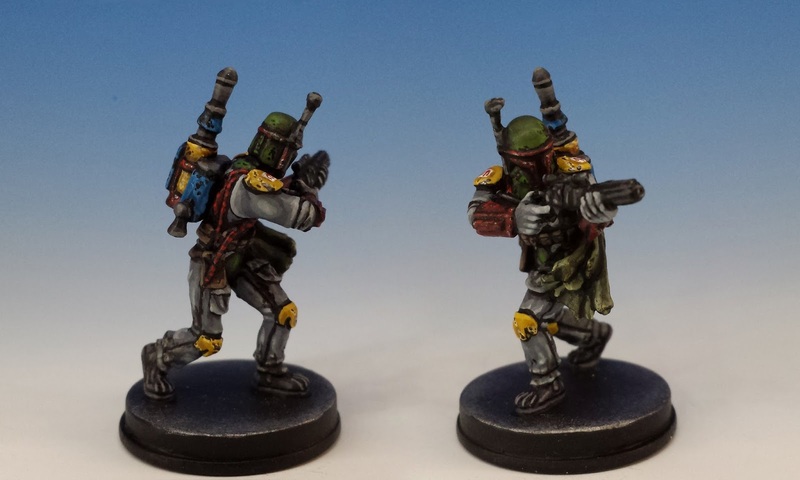 I've had the pleasure of painting the old West End Games Boba Fett figure AND an unusual 15 mm scale miniature of him, and I went for a similar approach. So much fun! Anyway, thanks for this, I'll have to keep an eye on your blog. Thank you Allison! I'm intrigued by this 15mm miniature. I didn't know there was a 15mm Star Wars range. Highlander Studios made some "Space Pals", that are quite reminiscent of some popular Star Wars characters. They're unofficial of course. 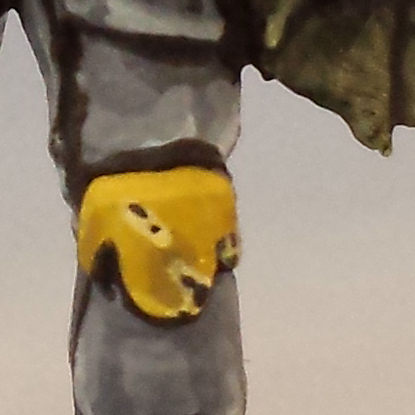 But nice little sculpts, certainly. I'd never heard of Highlander. It looks like they're (unsurprisingly) a little furtive about their Space Pals. But they're neat sculpts. Speaking of copyright infringement, I also like their more recent "Space A-holes" (aka Guardians of the Galaxy). I love Imperial Assault - it's probably my favourite skirmish game right now. It really is fast, and has lots of SW flavour. The "campaign" version of the game is less striking - I find it gets a little bogged down. Wonderful stuff as usual, your arenas of techniques grows ever stronger. We have to play a game together soon. I love your paintwork on your figures, but I've also got to say, that R2-D2 is really fantastic! Oh man - R2 took me forever. So I'm glad you appreciate him. Seriously, I was on vacation at the time, and I think I devoted almost 2 days to him. I'm not even sure what took me so long... I guess it was trying to delineate all of the panels, without relying on black paint. Nice, very nice job...a beautiful collection! I had exactly the same experience with oils as you Matthew. I used them for the first time last year, weathering up my Helsreach walker. The only downside (which is only minor) is that they take a long time to dry. But for replicating mud, grime & oil stains you can't beat them IMO. Those ST look great. I don't think I've ever had the chance to paint pure white before, but I know it's not easy. Hi, did you study C3pO ? He now has a silver leg in the movies etc, so need to know if this is something you might have missed? I was going for the early C-3PO from A New Hope, where all his limbs are original.